Michael Haskins writes colorful political mystery whodunnits depicting the curious culture of Key West in ways outsiders rarely get to see. Great dialogue, intrigue & characters - I also especially like Father Padre and Tita, his elusive girlfriend. Enjoyable & entertaining. As a fellow Key Wester, I can say with certainty that Michael Haskins is one of the shining lights of the Key West literary community. 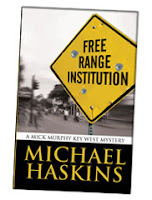 FREE RANGE INSTITUTION, a fast-moving mystery in his successful Mick Murphy series, is one reason why. I'm honored to be in the Casa Marina Group with him, a local authors critique group.